I have been a Food Runner for about 8 years. It's a very important part of my life. I have 2 afternoon runs each week. On Thursdays I pick up at Micro Tek on Merchant at Montgomery and at Kokkari Restaurant on Jackson and Front. 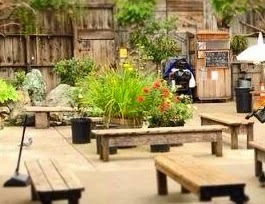 I deliver to APWC, Asian Pacific Wellness Center on Polk between Eddy and Ellis. On Fridays I pick up at Max's Market, on Pine between Montgomery and Kearny and at Craigslist on Sutter between Kearny and Grant. I deliver to the Sala Burton Manor, a residential building for low income seniors and disabled on Turk between Hyde and Larkin. At each of these stops I am greeted warmly and appreciatively, especially where I deliver. I love being a Food Runner . I know how much this organization is doing for the less fortunate among us. I've made many friends along the way on these runs, and I know that I have a part in giving back. Not only is what I do appreciated by the people I have contact with, it's a great feeling I get in being part of this organization. It's a win-win-win for the people passing on excess food, for the people receiving it and for us, as Food Runners. Finding something my daughter Jeannie and I want to do together isn't always easy, given that I am 66 and she is 17. But we are totally "as one" when it comes to our love of doing food runs. Saturday mornings we pull up to Kara's on Scott Street where their staff helps us load mountains of day old cupcakes into our car. It's a cargo that gets us a warm welcome when we deliver it to the team at the Haight Ashbury Food Program. Sunday afternoons we gear up for the Fort Mason Farmer's Market run. I say "gear up" because we begin by stocking our SUV with a hand truck, plastic bins and all the boxes and bags we can find. 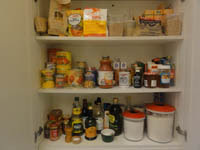 Over time we have learned that we need to be well prepared given we will be collecting a lot of food in a short timeframe. The vendors at the market are a great group. They give us an incredible assortment of vegetables, fruit and pastries. 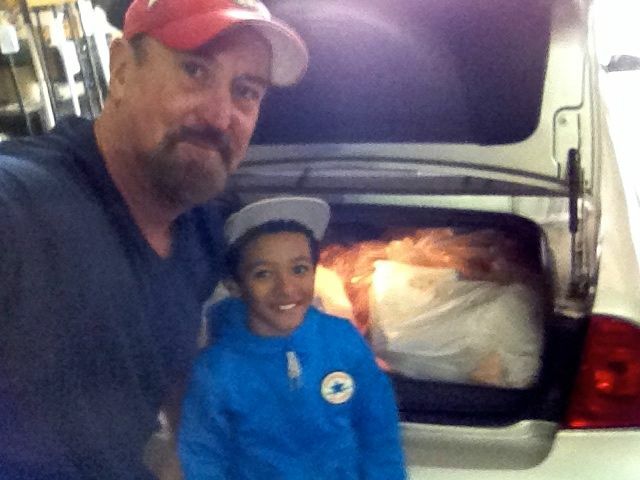 It fills our SUV to the top. We then head over to the Veterans Academy in the Presidio, where the veterans (mostly my age) take all that they can use. What's left we take to Walden House. It's a fast, tiring two hours, but we love it. Got cargo bike? Or know anyone who does? The "new wave" is here. Food Runners is seeking volunteers with cargo bikes to pick up food in congested downtown areas where automobile parking is non-existent. Feed the hungry, save the environment and get some exercise in one fell swoop. Sign up here or call 415-929-1866. Best phone call ever! To donate food, post your request on our app or call 415-929-1866. "Do you think food will be coming today," North Beach Citizens staff member Theresa inquired of Food Runners one recent Tuesday afternoon. Five minutes later, Food Runners volunteer Jim B. delivered an unbelievable spread of fresh catered food leftover from a downtown tech company lunch. "Steak AND chicken?!" 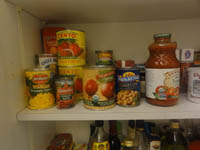 Theresa marveled as she read the labels on the containers. "Wow. 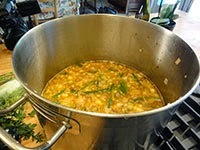 This will go a long way in keeping our clients bellies full." 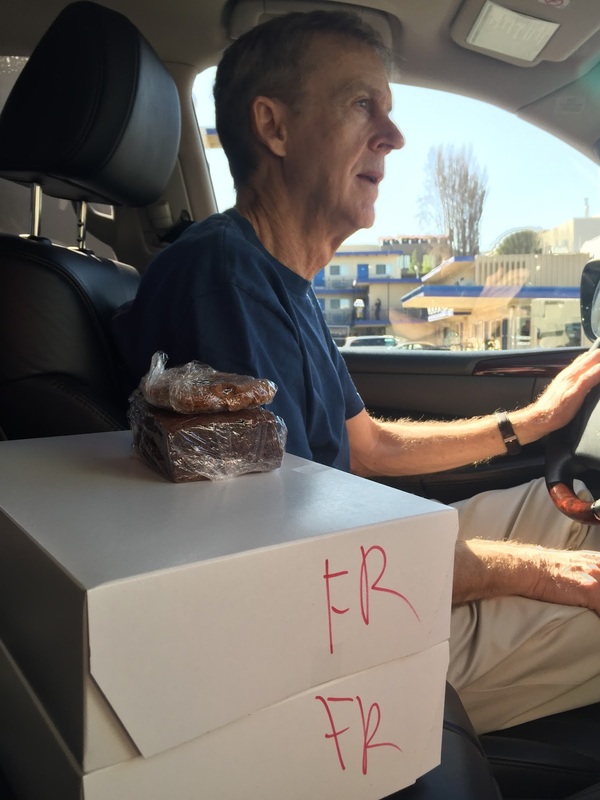 Delivering to North Beach Citizens means a lot to Food Runners. 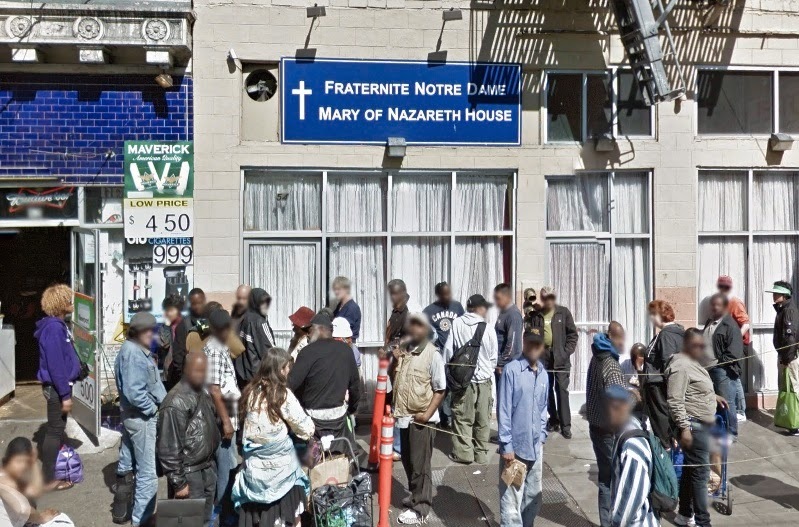 North Beach Citizens is a wonderful, drop-in center for the homeless founded by Francis Ford Coppola in January 2001. Through a collaboration of North Beach residents, merchants, police and service providers, including Food Runners, North Beach Citizens helps the homeless and low income community rebuild their lives. The idea for the organization stemmed originally from Coppola's strong feelings about panhandling. "Panhandling is an unacceptable act for both parties." 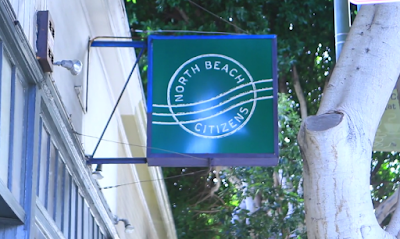 After meeting with prominent North Beach residents to discuss ways to address homelessness in the neighborhood, North Beach Citizens was born. 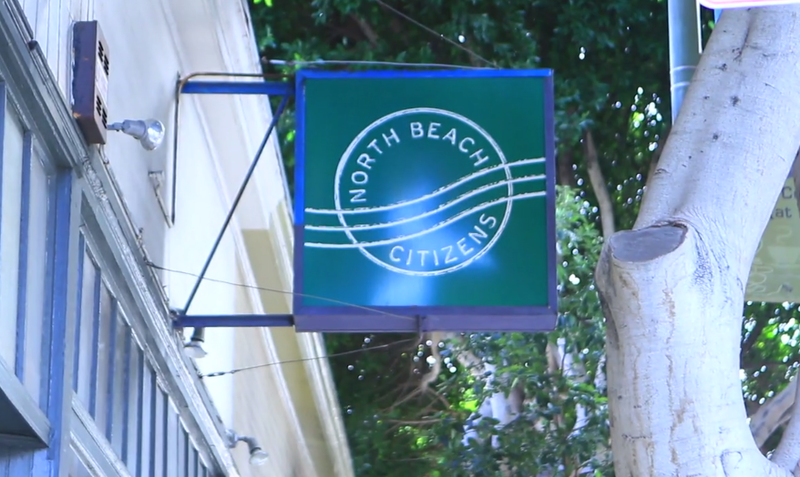 Rather than simply feeding people and sending them on their way, North Beach Citizens serves as a complete resource center where the paths of people's lives are changed forever. "I first started coming because of the food," explains one 60 year old client. 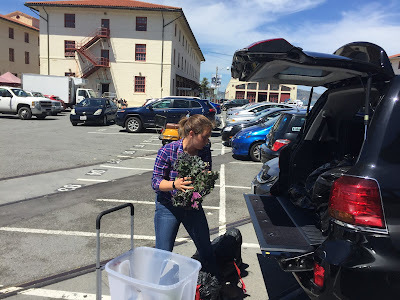 "But, North Beach Citizens provided me with so much more. I could use the phone. They helped me get I.D. so I could get a room. They showed me how to fill out forms for services correctly. They gave me clothes and sometimes even helped with bus fare. North Beach Citizens saved my life, because before I started coming, I had nothing." 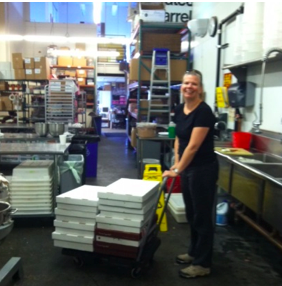 "Food Runners is a huge part of our support system," reports North Beach Citizens Director, Kristie Fairchild. "The nutritious food delivered by Food Runners volunteers increases our clients health and mental clarity. 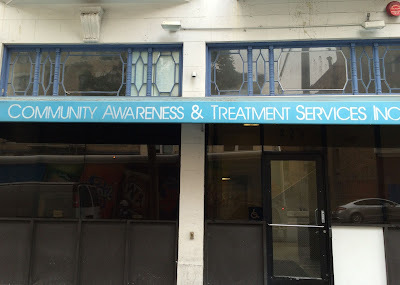 It bolsters their ability to be prepared for the kinds of appointments they need to go on in their quest to get off the streets; be they medical appointments, job interviews, meeting potential landlords and more." 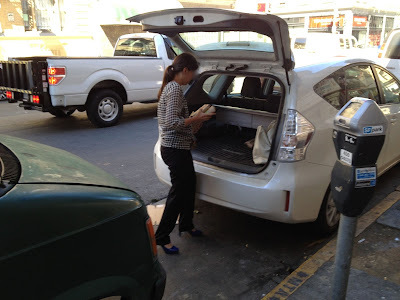 Food Runners and North Beach Citizens: a perfect match. Food Runners volunteers never tire of saying how meanigful delivering to North Beach Citizens is to them. And, both Food Runners and North Beach Citizens couldn't be more pleased about how working together supports an important part of the mission of both organizations which is, creating community. Are you attending any fabulous BBQ's or weddings this summer? 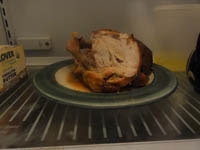 Ask the catering staff what's happening to the leftover food. Tell them about Food Runners. 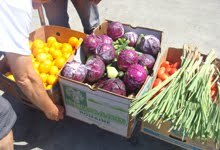 Donating good food to those in need is just an app tap or phone call away at 415-929-1866. SAN FRANCISCO – April 20, 2015 – A new app lets San Francisco food businesses notify Food Runners about excess edible food, and helps volunteers keep up with the latest food runs in their area to deliver to agencies feeding the needy. 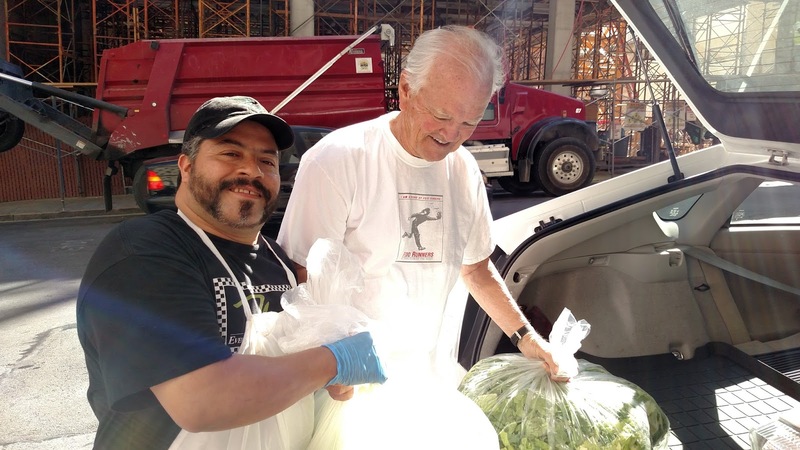 The San Francisco nonprofit organization delivers more than 17 tons a week of perishable and prepared food that would otherwise be thrown away. 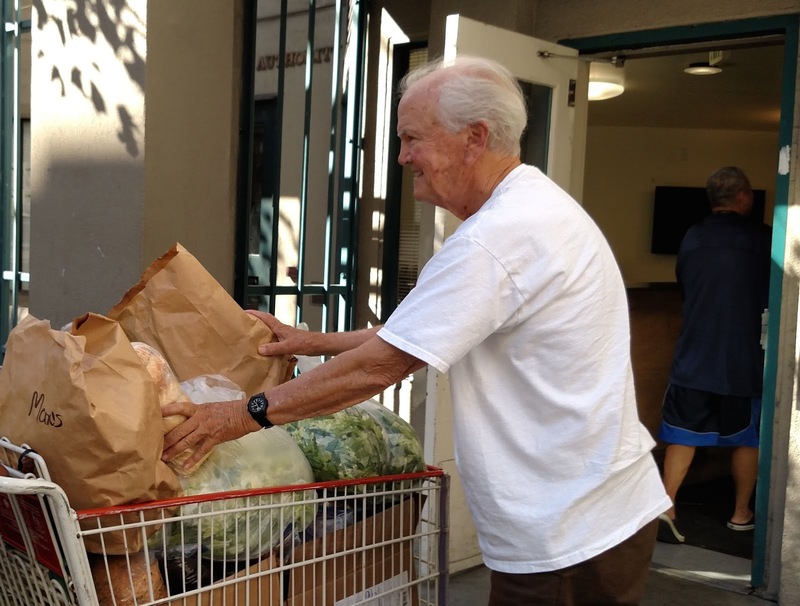 Recipients range from senior centers and homeless shelters to halfway houses and others in need. Food Runners regularly picks up excess inventory at businesses including restaurants, caterers, bakeries, hospitals and hotels. Some examples are Whole Foods, cafeteria leftovers at Twitter headquarters, and food overages at private and public events. 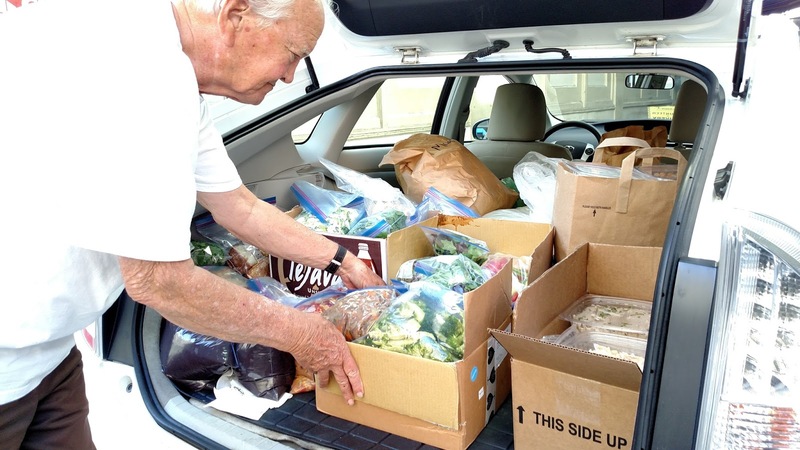 Volunteers generally give one hour a week to pick up and deliver food in their own vehicle. A mop of chestnut curls bobs about Ella's face. A sprinkle of freckles dances across her nose. Her eyes sparkle. Her gap tooth smile captivates. Ella is eight years old. Ella is a Food Runner. 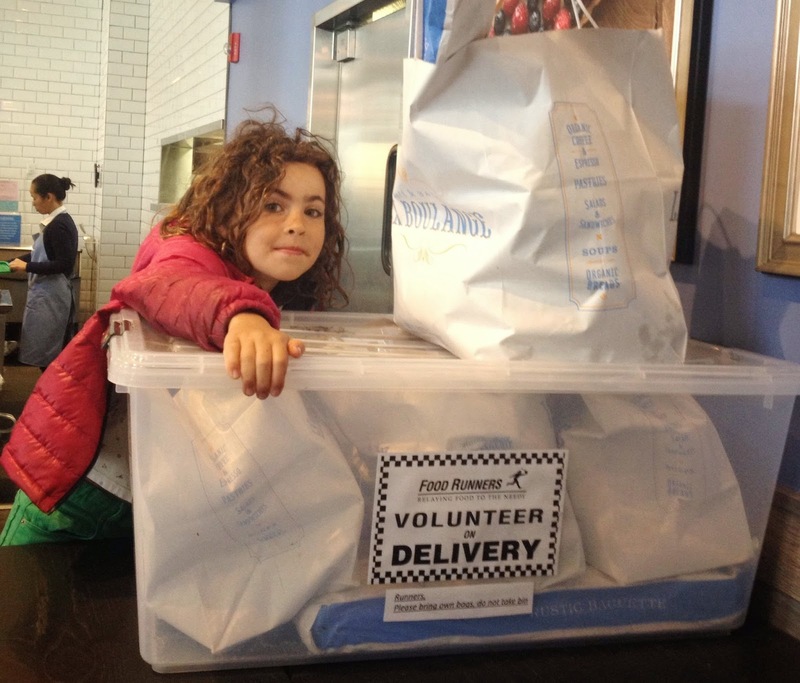 Two mornings a week, alongside her father Julien, Ella collects donated baked goods from La Boulange on 9th Avenue for delivery to the Haight Ashbury Food Program and Walden House. "I am doing Food Runners because it feels very good that I am helping people and your heart grows a little bit bigger when you help people," states Ella with magnificent earnestness. "It is really exciting to do it and it is fun because you get to go to different stores and have different opinions about each store. Chef Al [La Boulange] is really sweet. I like him a lot. The people at La Boulange are really nice. It is really awesome." "Doing our two runs a week has allowed Ella and I to truly build an incredible relationship," intones Julien. 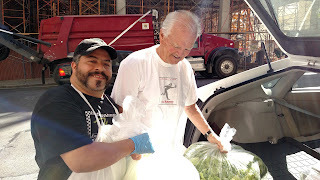 "Both of us are committed to our friends from La Boulange, Haight Ashbury Food Program and Walden House. Our relationship is no longer just Father/Daughter but peers who enjoy having responsibilities. Looking at Ella, building her own relationship with people such as Chef Al is truly special. Ella is growing fast and her core values based on happiness, empathy and true joy of sharing are making her extremely personable. 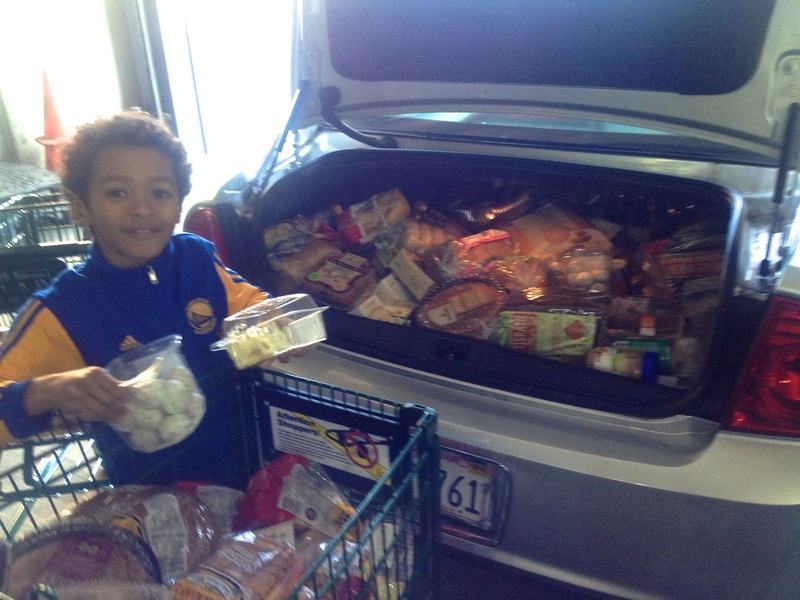 I can't be thankful enough to Food Runners for the true purpose they have created for Ella and I." "Living in Marin county can set up some unrealistic expectations about life and social status," states Danielle. "Joining Food Runners and doing a regular run with Suzie when she was a young teenager helped her see the wider community within the Bay Area. It showed her that you feel good when you help others and that what you do makes a difference. She even brought her boyfriend once so he could see what she was doing on Saturday mornings. I know she was proud of our efforts although I never heard those exact words. It was evident nonetheless. What I like best - sharing time with her, doing something I believe in so she can form her own values around giving and being part of a community." "It's great that we get the time together each week to enjoy each other's company while we team up to do something we both think is so worthwhile," says Tom of the Saturday morning run he does with his high school age daughter Jeannie. "I think she would say it feels great to help others and that it has made her much more aware of how many needy people there are out there." "I’ve done almost all my runs with my then 7 (now 8) year old son, Oliver," recounts volunteer Jerry. 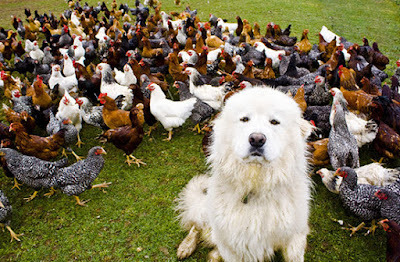 "From his perspective, getting to go behind the scenes at Whole Foods or a big hotel kitchen is fabulous. And he thinks it’s great how the food we deliver makes people happy, even if his perception is it’s not always a lot. 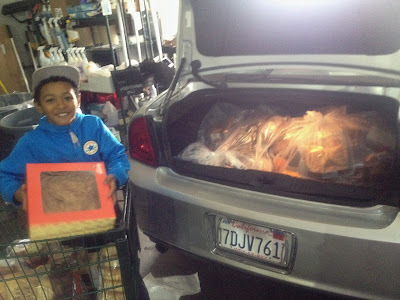 He loves helping to bring in the food, especially to the enthusiastic crew at SF Quaker Meeting. From a parent perspective, I’ve enjoyed the bonding time, and exposing him to situations he might not otherwise encounter." "My son Jason has been coming on runs with me for three years. 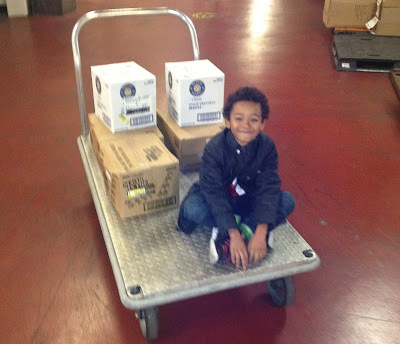 He is now seven and he is able to help me load and unload deliveries. Thank you for what you do and for letting us be a part of it." "I love doing food runs with my kids," states long time volunteer Sarah. "I always take them along. It gets them off their screens and out of the house doing something worthwhile. The price is right too. When we finish a run, my little one always asks, "did I earn my angel wings, Mommy?" Thank you, Food Runners, for providing such a wonderful opportunity for my kids to learn about giving back. A weekend without Food Runners is like a weekend without fun." Are you looking for quality ways to spend time with your kids but aren't sure what to do? Take them on a food run. 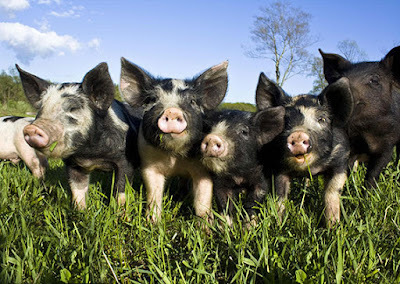 Then tell all you friends about Food Runners and how they can get invovled. There are three ways to help. Donate time. Donate food. Donate money. Any way you slice it, donating to Food Runners is fast, it's easy and it's fun. And most importantly, it makes a difference. It's a nasty block. One of the worst in the city. It pulsates with the sights and sounds of life on the edge. The extreme edge. People in varying degrees of disarray mill about aimlessly, some quietly going about their business, others shouting at invisible companions or shouting at their neighbors over perceived slights. It's not pretty. Amidst this chaos, in the middle of the block, behind the windows obscured by lace curtains, you will find the hardworking Sisters of Fraternite Notre Dame. Sister Marie Benedict is the tall one; Sister Mary of the Angels, the tiny one. They are tireless. They are devoted. 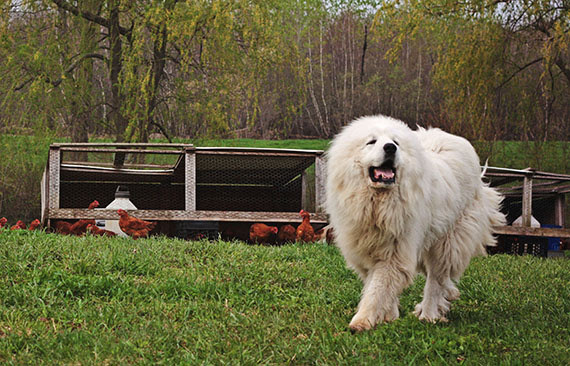 They speak in melodious, French accented English. They wear long, flowing habits, the kind rarely seen anymore except in movies or medieval paintings. Together, from their soup kitchen at 54 Turk Street, they feed 300 people at a clip in a space no larger than your living room. The Sisters serve lunch at the soup kitchen on Mondays, Tuesdays and Wednesdays. The line begins forming well before the doors open at 11:30. Everyone behaves. Everyone is grateful for the Sisters. Some of the more intrepid locals even volunteer to help cook, serve and wash dishes. "I need about 4-5 volunteers everyday to make the kitchen run properly," reports Sister Marie Benedict. "Some ask if they can 'elp. Some I choose from the line if they seem ready." On Tuesday evenings, the Sisters haul a couple of folding tables, a canopy and food for an army to UN Plaza where they serve a hot meal to an average of 500 people. 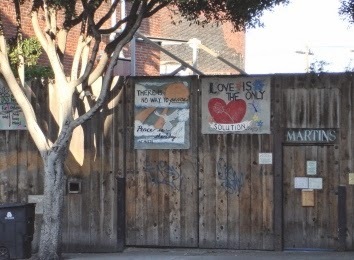 On Wednesdays, the Sisters head to Bayview where they seek out those living in makeshift encampments under freeway bridges and other hidden places in the area. The Sisters make sure everyone they find gets a hot meal. On Thursdays, Saturdays and Sundays, Sister Mary of the Angels sets up a booth and sells baked goods at various Farmers Markets in order to help with expenses. 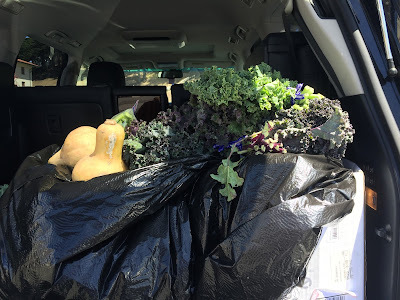 On Thursdays, she can be found at the Daly City Farmers Market; on Saturdays at Diablo Valley Farmers Market in Walnut Creek; on Sundays at the Moraga Farmers Market. 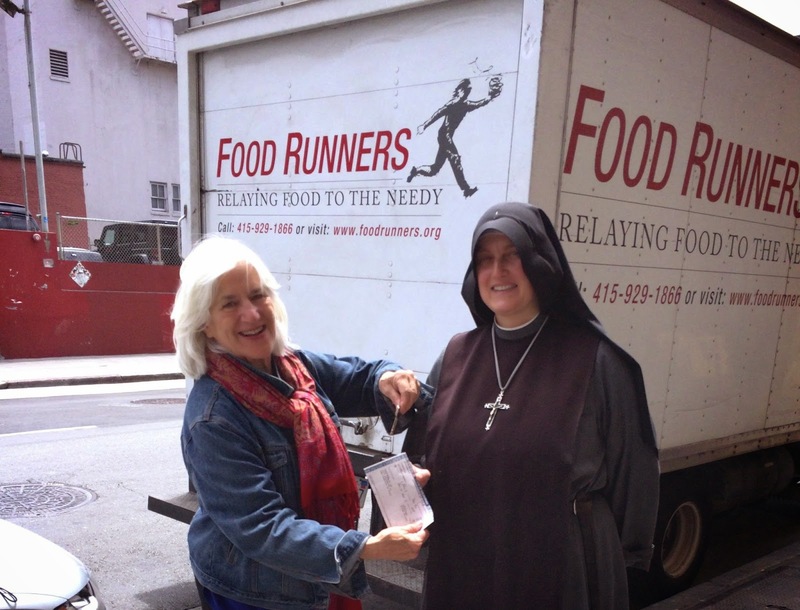 Food Runners has been helping the Sisters fulfill their mission to “provide help to the least ones and the poor" ever since discovering Fraternite Notre Dame back in September of 2009. 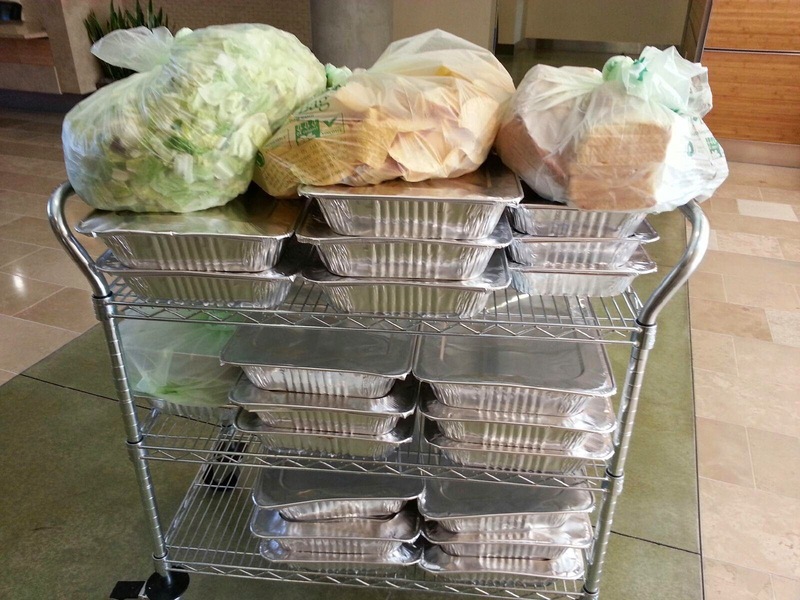 Food Runners delivers over 1 ton of food per week to the Sisters. 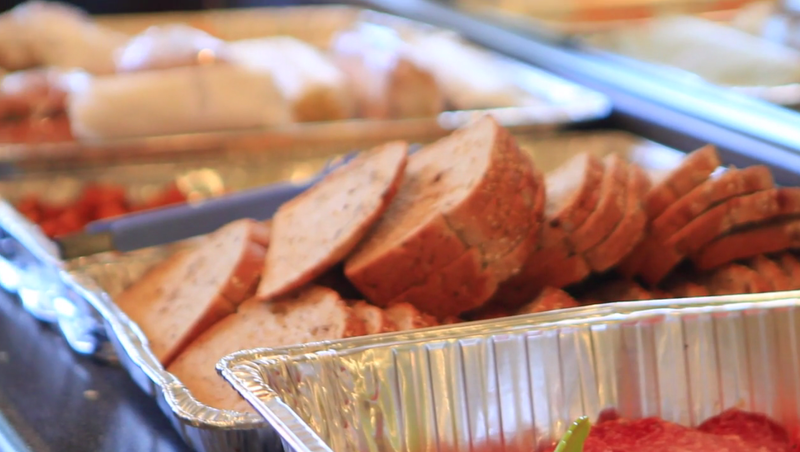 Everything from baked goods to groceries; whatever they need, Food Runners is there. "Delivering to the nuns felt like an epiphany!" 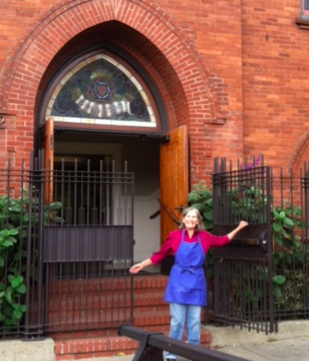 raved volunteer Thelma G upon occasion of her first drop-off. "When Sister Marie Benedict thanked me and looked at me with those blue, blue eyes, I felt that much closer to Heaven. And, coincidentally, I am learning French, so I got to practice. I can't wait to go back. 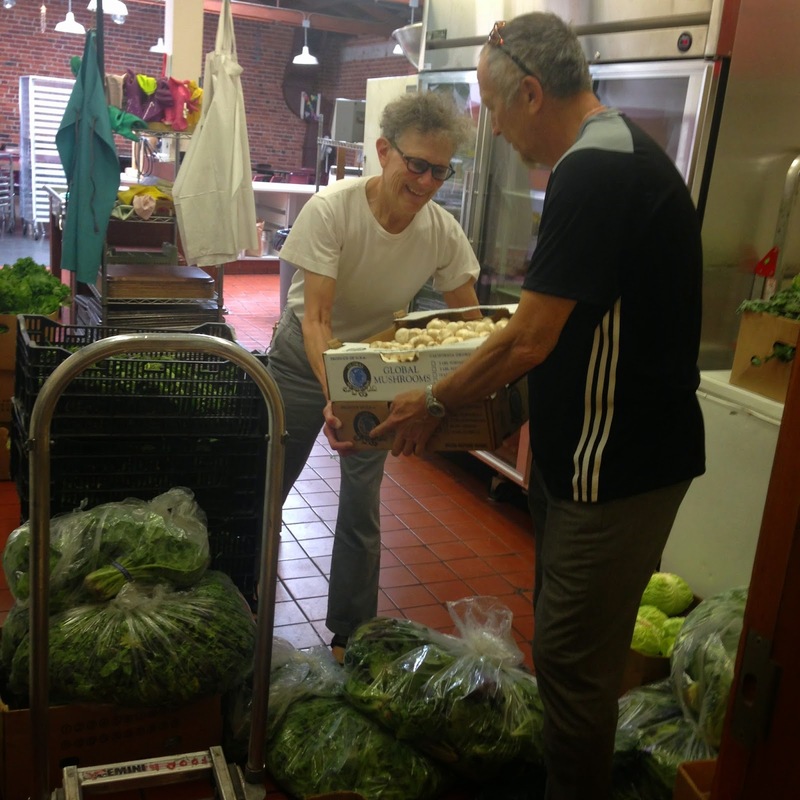 What they are doing is amazing and Food Runners is such a great way to be a part of that." Food Runners partners with the Sisters in other ways beyond delivering food. For example: upon purchasing a new truck last July, Food Runners proudly donated the old truck to the Sisters who'd been praying for a truck for years. 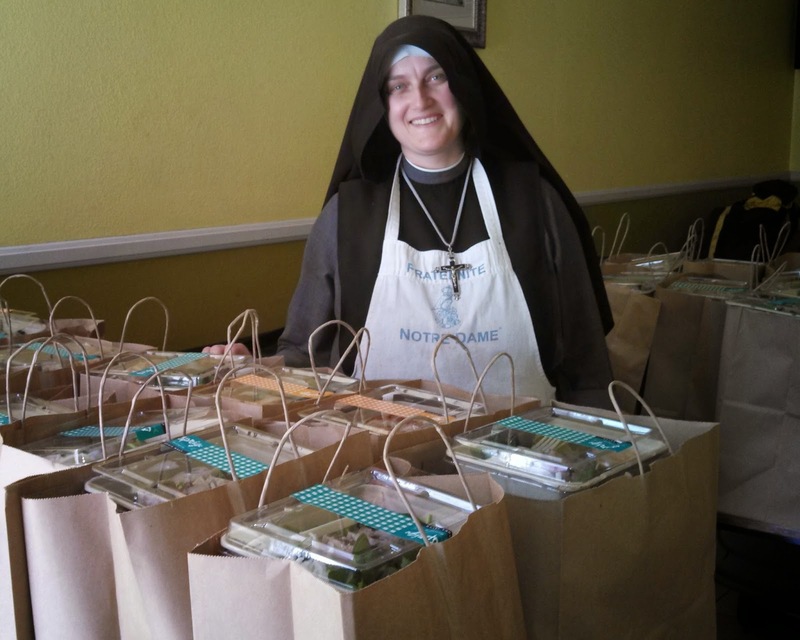 On Thursdays, Food Runners transports Sister Mary of the Angels and her wares from the Daly City Farmers Market back to her home base on Turk Street in order that Sister Marie Benedict attend to other necessary business. Three years ago, Food Runners connected Fraternite Notre Dame with Chef Tim Schaeffer of McCall's when Tim was looking for a volunteer opportunity to cook for those in need on Thanksgiving. 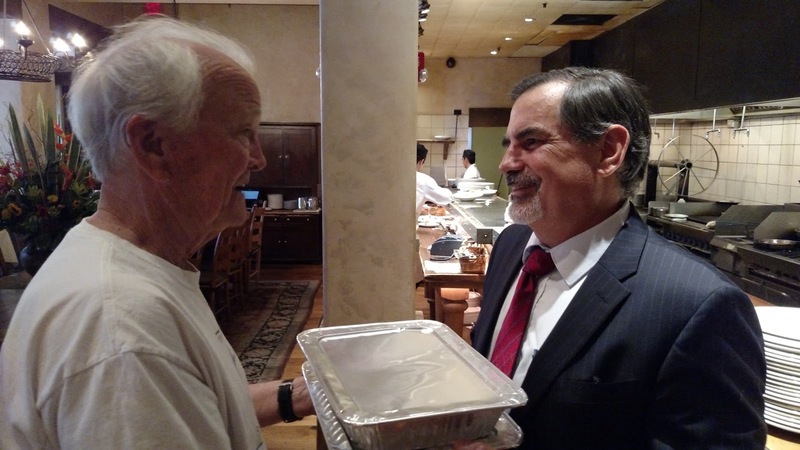 Tim has been cooking Fraternite's Thanksgiving meal every year since! 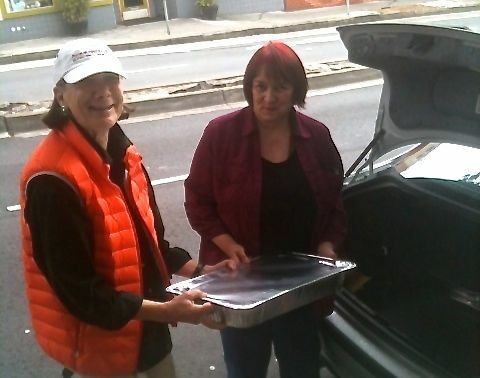 This past December, Food Runners volunteers provided transportation for the Sisters and their gear to and from UN Plaza for their Tuesday evening meal service. 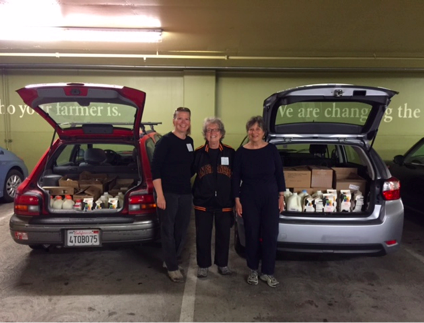 "The traffic was a complete nightmare," sighed volunteer Julia S of her December 16th contribution. "But meeting Sister Mary of the Angels was worth every bumper to number moment." 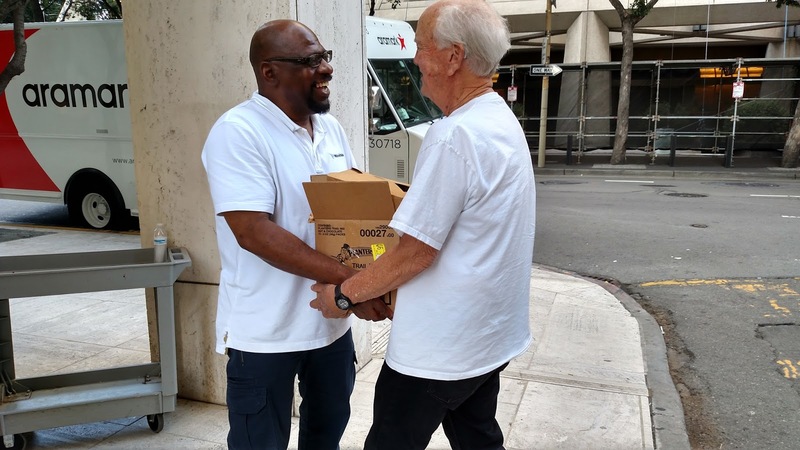 Food Runners couldn't be prouder or more eager to support the Sisters of Fraternite of Notre Dame in their extraordinary work feeding the hungry of our community. Good is as good does and working with the Sisters is all good. It's a new year! 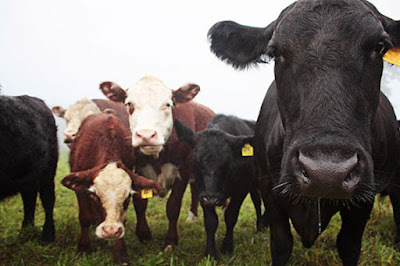 Remember to spread the word that Food Runners is always looking for more food. Tell your local restaurants, grocery stores, bakeries and other businesses that they never have to throw away or compost good, edible food. Food Runners is just an app post (yes! Food Runners has an app. SO easy!) 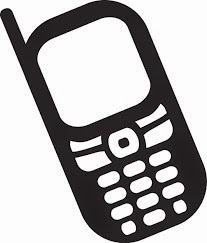 or a phone call away at 415-929-1866. And don't forget to tell your friends that they can help too by becoming a Food Runners volunteer or by making a monetary donation to Food Runners. Giving back never felt so good!